The Kurdish-Yezidi women Nadia Murad who has been kidnapped, tortured and raped by Islamic State terrorists, became a symbol of campaign for hers Yezidi people and against global sexual violence. Brussels, 7 Oct 2018 - Middle East Diplomatic - The Kurdish-Yezidi women Nadia Murad (25) who has been kidnapped, tortured and raped by Islamic State terrorists, became a symbol of campaign for hers Yezidi people and against global sexual violence. 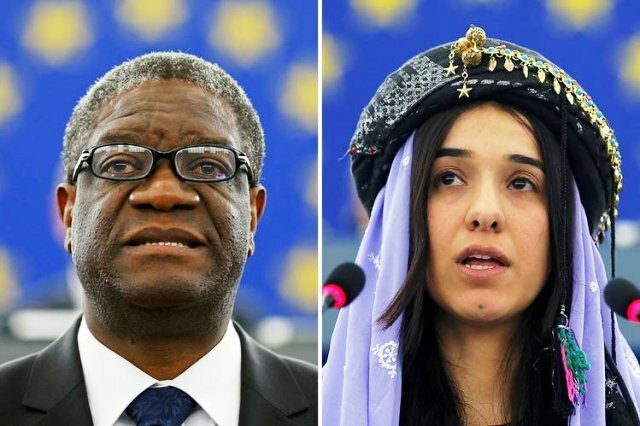 Norwegian Nobel Peace Committee awarded Nadia Murad and the Congolese gynaecologist Denis Mukwege for 2018 Nobel Peace Prize for “their efforts to end the use of sexual violence as a weapon of war and armed conflict”. As many thousands of other Kurdish Yezidi women and teenager girls, Nadia Murad has been kidnapped by Islamic terror groups in 2014, enslaved and raped by ISIS criminals until she could escape. The Kurdish Yezidi lady, the UN Goodwill Ambassador Nadia Murad says Islamic State terrorists should be punished for the crimes they did against all humanity, particularly against hers Yezidi people. "For myself, I think of my mother, who was murdered by DAESH (ISIS), the children with whom I grew up, and what we must do to honour them. Persecution of minorities must end. We must work together with determination - to prove that genocidal campaigns will not only fail, but lead to accountability for the perpetrators and justice for the survivors” said Nadia Murad. Murad was awarded the Nobel Peace Prize alongside Denis Mukwege, a gynaecologist who treats victims of sexual violence in the Democratic Republic of Congo. Dr Mukwege along with his colleagues, has treated tens of thousands of victims. Both winners of the 2018 Nobel Peace Prize has several awards for their human rights campaigns.